Hofstra Pride Guides: Pride Guides take Kentucky! 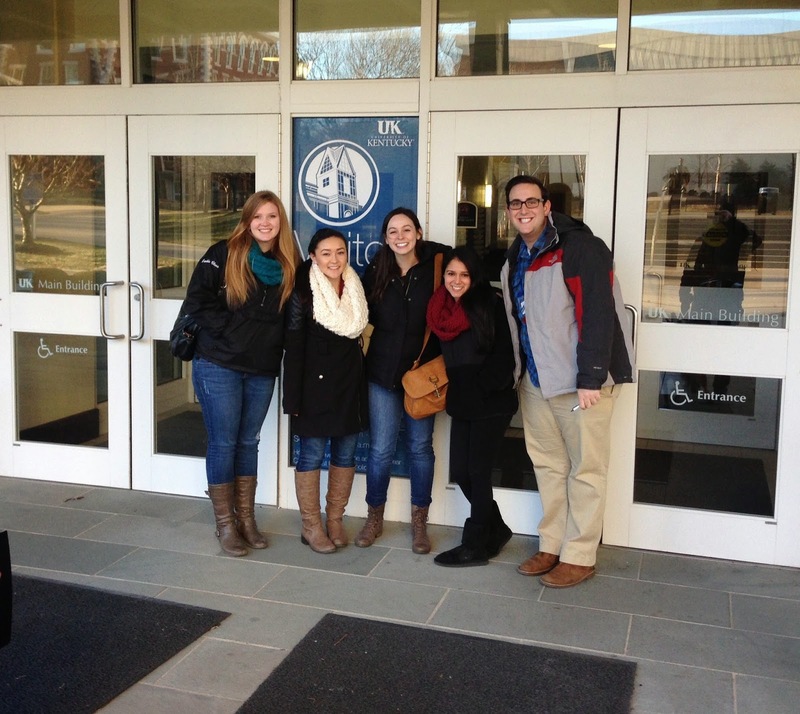 Pride Guides Cristina Vintimilla, Melanie Rainone, Jane Mitchell and Jordyn Mayerhofer traveled to Lexington, Kentucky with campus visit coordinator Andrew Cohen for the 2015 Collegiate Information and Visitor Services (CIVSA) Student Conference. Representatives from more than 50 collegiate institutions came together for this tour guide conference. Our Pride Guides were able to explore the city of Lexington, mingle with tour guides from around the country and tour the University of Kentucky and Transylvania University. Find out their favorite part of the conference and what they took away from it! “Day one in Lexington was cold. We toured two universities and I was ready to get back to the hotel, eat dinner, and find out who I'd be competing with for the Amazing Race. This was a two-hour scavenger hunt around the city of Lexington," said Cristina, a sophomore journalism major with minors in business and design. "I love scavenger hunts but I do have to admit the 7-degree weather slowed us down. I found myself bonding with a tour guide from the University of Arizona. It's so hot there that they’re required to wear khaki shorts and sunglasses on tour (I wish!) The competition was exciting and gave us all an opportunity to get to know each other beyond just being university tour guides," Cristina said. “My favorite part of the conference was listening to the presentations that were put on by schools and students from all over the country. It was great to hear from people whose strengths and weaknesses are different than our own so that we could take back what we learned.” said Melanie, a junior journalism and creative writing major. “What an incredible weekend in Kentucky at the CIVSA Student Development Institute! While it was fun to spend time with the members from Hofstra on the trip, my favorite part was being able to meet student ambassadors from other schools from around the country," said Jane, a sophomore health sciences major with a minor in biochemistry and community health. "Throughout the weekend we were able to meet in mini breakout sessions to really get to know about 10 other students from all over the country. This was my favorite time because in this small group we were able to talk about our own programs to see what cool things were happening at other schools. This was a time for story exchanging, collaborating, and friend-making! I enjoyed getting to know other enthusiastic students while sharing ideas about how to improve our own tours and our student ambassador programs,” Jane said. “During the CIVSA conference, we toured two schools: The University of Kentucky and Transylvania University. Comically enough, even though I have been a Pride Guide since my sophomore year, this was my first college tour. During my college search, I never toured a school. We began the day with UK, which has around 19,000 undergraduates. That is about 2.5 times bigger than Hofstra. As our tour guide talked about all of the impressive amenities that UK has to offer, I was able to proudly say that Hofstra offers the same. From psychology research opportunities, to an extensive on-campus police force, and a newly-renovated fitness center, I found myself seeing Hofstra everywhere we went." said Jordyn, a junior pre-med studies major with a minor in biochemistry and neuroscience. "Then, we headed over to Transylvania University, or as they say "Transy”. Transy has an undergraduate population of around 1,100 students, which is about 1/7 of Hofstra's undergraduate population. My second college tour really focused on the individualized attention Transylvania offers students and the tight knit community on campus. Again, I saw myself seeing Hofstra. When the tour guide talked about the personal interactions she has had with her professors and small, intimate classes, I was thinking of the network of professors that I have developed true relationships with at Hofstra and my Ancient Greek 2 class with only four students," Jordyn said.